Blessed Virgin Mary Patronal Feast will be held at 5:30 p.m.on Sunday, September 16, 2019 at Our Lady of Peace celebrated by Father James Loughran. Download and print the program. The 99th Anniversary of the Dedication of Our Lady of Peace was held on Sunday, April 15, 2018 at 5:30 p.m. celebrated by Father James Loughran. Download and print the program. On September 8, 2017, we were able to celebrate the BVM Patronal Feast on the Nativity of the Blessed Virgin Mary! This wonderful event was a high mass, including Adoration of the Blessed Sacrament and the Anointing of the Sick. With so many in attendance, there is proof of a strong community of faith to support this church in the future. And we were able to celebrate and fill to standing room only our 98th Anniversary of the Dedication of Our Lady of Peace inside our beloved church on Good Shepherd Sunday, May 7, 2017! But our journey is not finished! These events have given us a deeper appreciation of our faith and the promise to generations of Catholics. We want the doors open again for public and private worship and the sacraments! The Congregation for the Clergy sent us notice that our case files have been sent to the Vatican Supreme Court, the Apostolic Signatura, for review. The Congregation issued their decree regarding the merger and closure of Our Lady of Peace on December 28, 2016. The news reached parishioners in January 2017. While the decree provides the minimum rights of entry - Masses on the patronal feast and solemnity of the anniversary of the dedication of the church, parishioners will appeal to the Apostolic Signatura, the supreme court of the Vatican. The decree also provides that the church will be open for private and public worship. But the church remains locked and has only been opened for 3 funerals and one previously scheduled wedding since closure. The Archdiocese did not wait for the matter of the merger to be resolved. They simply went to civil court to merge the church corporations without the knowledge of the parishioners of Our Lady of Peace. They used the same trustees for both church corporations to consent to the civil merger in June 2016. Although the church was closed on July 31, 2015, you can still help save Our Lady of Peace Church, founded in 1918 by Italian immigrants! First, we thank you for whatever you are able to do. Please begin by reading and signing our petition and following us on Facebook, Twitter, or our blog. You may write letters of support to the Vatican and to New York state and city officials. If you live in NYC, you can bring an ivory candle to the church steps and help keep our Perpetual Light Vigil. You are welcome to join our 54-Day Rosary Novena each day at 6:00 p.m. at the church steps. If you would like to do more to preserve the church, please click on this link to review the Friends of Our Lady of Peace Fundraising Campaign. Your many acts of kindness are appreciated. The Archdiocese of New York notified 55 churches that they will be merged, as reported in the New York Times, the result of an initiative, Making All Things New. Merged is code for eventual closure! Also see the New York Times article about the NYC Mass Mob on January 25. But the Archdiocese did not publish the decrees regarding these mergers until February 11, 2015. For more than 3 months, the parishioners of these churches had been unable to obtain the copies they needed to appeal to the Vatican for recourse. On February 13, 2015, the New York Times broke the story, New York Archdiocese Parishioners See System of Secrets as They Fight Church Closings. Parishioners have appealed to the Congregation for the Clergy to stop the closure scheduled for August 2015. The Vatican first notified us in March that they will study this recourse until June. On June 1, the Congregation for Clergy mailed us a letter that they would continue to study our recourse through September 1, 2015. See Vatican to Review Some N.Y. Churches Set to Merge or Close in the Wall Street Journal. In August 2014, most parishioners first learned that the Archdiocese recommended merging Our Lady of Peace into St. Vincent Ferrer. Friends of Our Lady of Peace Church disagreed with this for reasons cited (click Petition next to Overview above), including solvency of the church, landmarked status, community outreach, and neighborhood value. On Nov. 2, Cardinal Dolan sent a letter with his decision to merge the parish of Our Lady of Peace into St. John the Evangelist at the archdiocese headquarters on 55th Street and 1st Avenue. People ask, what will happen to Our Lady of Peace Church if its parish is merged? A recent trend in New York City has seen many churches sold to redevelopers who convert their use, build, and sell residential units. 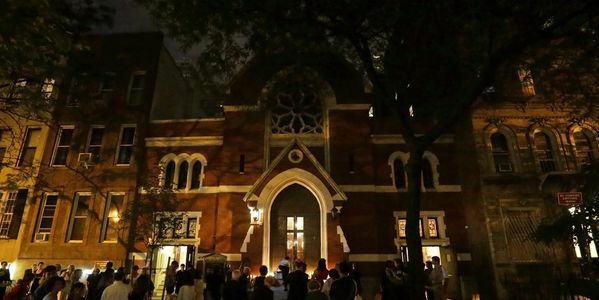 The New York Landmarks Conservancy has described this growing trend as a crisis: "If a substantial number of Catholic churches are closed or redeveloped, all New York City neighborhoods and other denominations will be impacted." We invite people of all denominations to sign below to preserve this church. Read Our Lady of Peace Church NYC blog and Friends of OLP Facebook page. Email friendsofourladyofpeace@gmail.com Keep comments dignified and respectful. ITALIANI -PER NOSTRI AMICI IN ITALIA! SALVA Our Lady of Peace (Madonna della Pace). chiesa fondata nel 1918 da immigrati italiani! L'Arcidiocesi di New York ha notificato 55 chiese che saranno uniti, come riportato dal New York Times. Fusione è il codice per l'eventuale chiusura! Il 2 novembre, il cardinale Dolan ha pubblicato una lettera con la sua decisione di fondere la parrocchia in San Giovanni Evangelista presso la sede dell'arcidiocesi sulla 55th Street e 1st Avenue. La gente chiede, cosa accadrà alla OUR LADY OF PEACE (Madonna della Pace) Chiesa se la sua parrocchia è fusa? Una tendenza recente a New York City ha visto molte chiese vendute ai costruttori che convertono il loro uso per vendere unità abitative. Persone provenienti da tutto il mondo sono invitati a firmare qui sotto per preservare questa chiesa per le generazioni future. Per saperne - OUR LADY OF PEACE NYC BLOG (Madonna della Pace) e Amici della OUR LADY OF PEACE pagina Facebook. Si prega di tenere i commenti dignitoso e rispettoso. Grazie! Our financial position is robust. We have a proven track record of being a consistent net producer for the Diocese, returning twice its Annual Appeal targets on a regular basis. Our parishioners, friends and benefactors are steadfast in their generosity and loyalty. These tight emotional bonds, forged over many generations, have translated into dedicated engagement and considerable and consistent financial contributions. Our church and rectory are landmarked buildings, meticulously maintained ensuring stability to this historic area. The history and service of our parish are a source of pride to every member of our community. Our outreach programs – RCIA, AA, Al Anon as well as Healing Masses, monthly City Harvest food drives and collections for the Henry Street Settlement enhance our community and contribute to a vibrant parish life. To sum up, in 1918, the early Italian immigrants sent a petition to Cardinal Hayes to ask permission to found a parish. They established the foundation upon which the church and parish are laid and from which so much has sprung... our present day Our Lady of Peace. In 2014, the signatures of our parishioners and friends below ask you to reconsider and allow Our Lady of Peace to remain where it has stood for almost 100 years to continue its mission. The Vatican rejected our recourse against the decrees changing the boundaries of Saint John the Evangelist and merging Our Lady of Peace for the second time with Saint John the Evangelist in a decree issued 28 December 2016, which reached our parishioner contact on 10 January 2017. Please visit our website at www.olpchurchnyc.typepad.com for more information! CARDINAL DOLAN revoked the decree of merger, changed the boundaries for the parish of Saint John the Evangelist, and issued a new decree of merger for Saint John the Evangelist and Our Lady of Peace. PLEASE READ OUR OVERVIEW FOR UPDATES & SHARE THIS PETITION! We are appealing again to open this church! TOMORROW Sunday, April 26 is FOUNDERS DAY! Walk with us at 11:30 a.m. FDNY Pipes and Drums, FDNY Columbia Association, The Patriot Brass Ensemble, Deputy Consul of Italy Isabella Periotto, Manhattan Borough President Gale A. Brewer, NYC Councilmember Dan Garodnick, Joseph Sciame, Chair of Presidents of Italian American Organization, parishioners and descendants of the immigrants who built and want to save OUR LADY OF PEACE NYC. ARE YOU A DESCENDANT of ITALIAN IMMIGRANTS and FOUNDERS of OLP? JOIN US! PROCESSION, FOUNDERS MASS, and CELEBRATION OF ITALIAN HERITAGE on APRIL 26, 2015 Line up for procession at 11:30 AM! ARE YOU A DESCENDANT OF FIRST PARISHIONERS of OLP? DONATE - keep church finances in the black! LIKE "FRIENDS OF OLP" page on FACEBOOK! PRAY Tuesdays at 7 p.m. VIGIL! WRITE to POPE FRANCIS and CARDINAL STELLA - TELL OUR STORY!